First, place your dried noodles in a bowl and cover with boiling water, leaving them to soak for 4-5 minutes while you chop your vegetables. Using the back of a teaspoon, quickly peel your thumb of ginger before finely slicing it with a sharp cleaver. Next, remove the dark green ends from four spring onions and roughly chop three of them into 5cm long strips. With the remaining spring onion, slice it into fine rings before setting it aside to use as garnish later. Finally, use the side of your cleaver to carefully crush your garlic. Place the prepared garlic, ginger and roughly chopped spring onion on one plate and set to one side for later. Next, move onto your beef! Chop the beef tendons into rough chunks and dice the brisket into large cubes, both around 3cm long. Leave to one side. Return to your noodles, which should now be soaked thoroughly. Use a pair of chopsticks to slowly separate the noodles from each other before draining the bowl and removing the noodles onto a clean, dry tea towel. Spread the noodles across the material and leave them to dry to one side to be added back into the soup later. Filling a wok half way full with water, bring it to a boil over a high heat. Carefully add your beef tendons, blanching them for approximately 2-3 minutes in order to extract any excess fat or solid impurities. When fully blanched, transfer the tendon pieces from your wok and into a bowl of cold water, draining all the liquid from the wok and leaving the tendons to one side for later. Time to get cooking! First, you need to flavour the base of your pan. Over a high heat, add approximately one tablespoon of vegetable oil to a large saucepan and swirl it around. Then, reduce to a medium heat and temper your spices: adding the star anise, bay leaves, cloves and stick of cinnamon to the pan and stirring through to release their aroma. Introduce your ginger and garlic and fry them for about 2 minutes until a gorgeous golden-brown, before finally adding the roughly chopped spring onion to fry for a further minute. Now, add your chicken stock to the saucepan and bring it to the boil. Leave the mixture to simmer for a minimum of 2 hours but ideally for 5, using a ladle every 15-20 minutes to remove the scum from the surface and deposit it in the bowl of cold water. 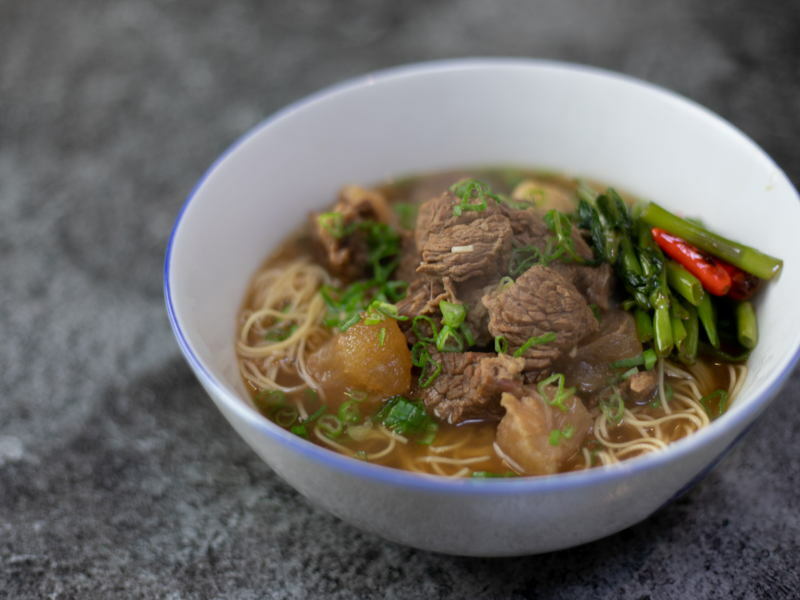 When the soup is cooked through, use a slotted spoon or bird’s nest to remove the large pieces of meat from the broth. In their place, add your dried egg noodles and simmer for 30 seconds to warm through. Transfer the noodles to a large serving bowl, placing the meat on the top before finally ladling the hot broth over the bowl. Scatter the rings of spring onion over the top to garnish, and you’re ready to serve!